I haven't had the time to photograph all the many generous gifts that Bubbles has been receiving from dear friends and family. Today however, a friend said she would pop by the office to say Hi, but due to her having to settle her little one, and me having to attend a meeting that my department is hosting, we didn't get to meet. 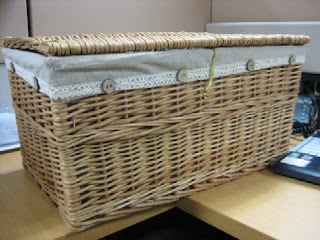 When I got back to my desk however, I saw this huge, beautiful basket on my table. I squealed! I knew that it must have been from her. And I was right! 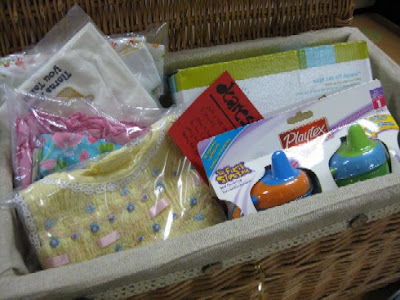 The basket is filled with pretty baby girl's clothes, 2 little sippy cups and a Baby Art kit! I'm now smiling all day eyeing this lovely treasure chest next to me, and feeling the warmth of the generous thoughts that went into preparing this gift. Very nice and thoughtful of your dear friend indeed! I agree! She's a real dear!